Writers of the Future winner Karl Bunker writes for Asimov’s, Analog, F&SF, and Interzone. His eclectic stories have been included several times in Gardner Dezois’ best of the year anthologies. Karl Bunker explains his eclectic stories. He also delves into the Singularity. CARL SLAUGHTER: “Gray Wings” and “The Woman from the Ocean” are character oriented; “This Quiet Dust” is premise oriented; “Ashes” and “The Remembered” are theme oriented; “Caisson” is hard science/steampunk(? ); “Worm Days” and “Flexible” are magic realism; “Ashes” and “Overtaken” are singularity based; “Bodyguard” is relationship; “Under the Shouting Sky,” “Pilgrimage,” “Overtaken,” and “The Madison” are space travel; “Ashes” is post apocalyptic; “The Remembered” is alien/fable; “Murder” is a mystery. Are you eclectic or do you have a preference? CS: You said “Ashes” and “The Remembered” are your favorites and meant a lot to you personally. Why? KB: It’s a combination of things. A good SF story will have some interesting ideas in it, and also have a human story that’s emotionally moving or at least engaging. In both of those stories I investigated some ideas that interest me a lot, and — to my eye at least — they’re both deeply moving stories. With “The Remembered” in particular, my wife found it so moving that it made her cry, and an author has to love a story that gets an endorsement like that from his favorite person in the world. CS: A lot of people misinterpreted “The Remembered.” How did they view the story and what were you actually trying to do with the story? KB: Based on the responses I got to that story in the critique groups I belong to, people were all over the place in their reactions to it. It’s an unusual story, with an odd narrative voice, characters who are talking alien squids (more like cuttlefish, actually), not much time spent with the ostensible main characters, an ancient alien myth dropped into the main story, and so on. For some readers the story just didn’t work as a story, others wondered whether it was supposed to be funny when it wasn’t, and at least one thought it must be the work of a rank beginner. And some people, including my wife, as I mentioned earlier, thought it was one of the best stories they’ve ever read. In the end it sold to Interzone, which is a great magazine, so I’m very happy about that. As for what I was trying to do with the piece, well, to present some interesting SF ideas and tell a moving story; the two things that all good SF should do, as I said above. Idea-wise, the story was largely inspired by Terry Carr’s wonderful 1968 story “The Dance of the Changer and the Three.” Carr’s story was very much about the potential unknowability of alien minds, and I wanted to do a story that looked at some reasons why aliens might in fact be very understandable and very “human,” even if they’re talking squids. I also had some fun looking at the ways in which an aquatic species might develop technology, and how they would view the alien environment of air and dry land. And lastly I wanted to tell a whacking great tear-jerker of a love story, because I’m a mushy romantic at heart. CS: “Caisson” is upbeat, but most of your other stories are about people struggling against harsh or seemingly impossible circumstances and have downbeat endings. Why this pattern? KB: It seems to me that science fiction writers in general aren’t that big on optimism and upbeat endings. I think this is unfortunate, but I don’t seem to be any more capable of upbeat endings than the average SF writer. CS: Gardner Dozois has reviewed several of your stories for Locus and has included them in three of his Year’s Best anthologies. He not only hasn’t given the thumbs down to one of your stories, he always greets them with strong praise. Any idea what it is about your stories that appeals to him? KB: Well, if I wanted to be cute I’d just say that Mr. Dozois knows good science fiction when he sees it. 🙂 Seriously, I guess he and I are pretty much on the same wavelength, at least with regard to my stories. I’m immensely grateful to him for all his support and appreciation of my work, of course. But one thing I’ve learned as a writer is that there’s almost no predicting who’s going to like what story. Someone might like 20 stories of a particular author and then hate the 21st, or two people might agree totally about the quality of one story and then be at opposite poles with regard to another. The interaction between a piece of fiction and a person’s tastes is a hugely complicated thing. CS: Speaking of which, I’ve read most of your stories and have had no trouble understanding them except “Caisson.” Most of the story is underground engineering. Toward the end, one of the main characters develops an obsession with something he finds. Then in the end, he and his family are living happily ever after. Did I miss something? The story takes place in a quasi-science-fictional environment — though it’s set in the 19th century and the environment is the underwater caissons that were used to build the Brooklyn Bridge — and the human story connected to that setting is about a man who has suffered a terrible loss, and who finds the strength to move beyond that loss through his connection with a magical thing that embodies the indomitable spirit of life. That would be my Cliffs Notes summary. 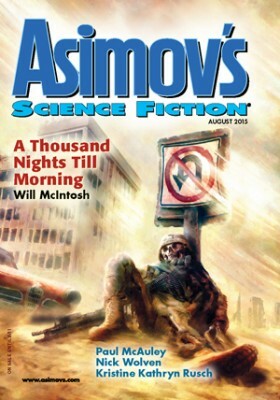 There are arguably problems with the story (which appeared in Asimov’s in 2015), but it’s earned some nice accolades, one or two of which I can’t talk about yet, so I guess it worked for some people. CS: What’s the progress on that Hong Kong vampire human mutant music professor sexual arousal lesbian triangle story? CS: What about the lighter piece about the aliens who migrate downhill every evening to make music for a human audience? KB: That one “350 K In My Shades” sold to Stupefying Stories/Rampant Loon Media, but it’s been stuck in sold-but-not-published purgatory for over 2 1/2 years, with no end in sight. Unfortunate and annoying, but such things happen sometimes. CS: In an earlier interview you said, “The singularity is the ten-ton elephant in the living room of current science fiction. If you’re writing a story that takes place more than a few decades in the future, you have to address the singularity in one way or another; if you don’t, you may as well have your starship captain writing his log entries on a manual typewriter.” What did you mean by this? What I meant was that there are very good reasons to believe that an artificial intelligence singularity is coming within the next few decades. Once AI software has been developed that is capable of creating better AI software, the result will likely be a feedback loop that quickly leads to super-intelligences. And super-intelligences, in turn, will almost certainly have some profound impact on the proverbial Life As We Know It. CS: Why do you reach for material from the golden age of sci fi when you want to relax? KB: The first science fiction I read, and in fact the first “grown up” books of any kind that I read as a child, were 1950s-era SF short story anthologies. Not that I’m quite that old — the anthologies in question were some old paperbacks that belonged to my father. So perhaps I “imprinted” on that kind of SF, kind of like Konrad Lorenz’s baby geese. So for “comfort reading” I often go to 1950s science fiction. But I also read plenty of contemporary SF, and a lot of so-called literary fiction as well.